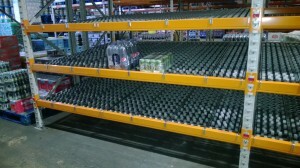 Hampshire Mezzanine Floors have recently installed a live storage system for Carlsberg. Carlsberg was founded in 1847 and since has become one of the world’s largest brands, offering some of the finest lagers available around the globe. Carlsberg required a system for efficiently picking small orders for cases of different small line products. 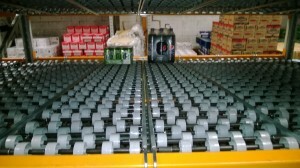 HMF provided a roller racking live storage system where steel shelf levels with heavy duty rollers are fitted into existing racking with the rear replenishment face pitched higher than the front picking face to form a gentle slope so that products run from the rear replenishment base down to the front picking face. – First in first out stock rotation for perishable drinks which ensures the freshest drinks are utilised first. – The system stores a significant amount of product, thereby saving Carlsberg space. – No disruption to the picking pace when replenishment is happening at the on load face. The installation was designed for Carlsberg’s Southampton depot and due to the success of the system Hampshire Mezzanine Floors have also subsequently fitted out two additional depots for Carlsberg using similar systems, in Ipswich and Bourne. The live storage system is easy to fit retrospectively in pallet racking and therefore can be installed very quickly saving disruption to the business. The existing pallet racking main support beams make a robust front and back to the live storage system which again makes the system far stronger and less prone to accidental damage by fork truck movements. The system at Southampton has also been extended to accommodate an additional 50% extra capacity and is working well.